Palestine came under Alexander's rule after he defeated Persian king Darius III in 330 BCE. Alexander III attacked and passed through Palestine in c.333 BCE on his way to Egypt. Coins were issued between 330-303 BCE in the name of Alexander III at the mints in Tyre, Sidon, Ptolemais, Joppa, Gaza and Ake. After Alexander's death, Palestine came under Macedonian Empire with Ptolemy I as satrap. Palestine with Syria and Phoenicia came under rule of Ptolemy I who was Alexander's satrap in Egypt . Ptolemy I declared himself King of Egypt in 304 BCE and Palestine came under Ptolemies till 200 BCE. Palestine mint city of Tyre. Seleucid King Antiochus III (223?187 BCE) defeated the army of child King of Egypt Ptolemy V Epiphanes at Panion, in Palestine. Thus, Sinai desert and Palestine came under Seleucid Kingdom in 200 BCE. Antiochus the Great (Antiochus III) ruled between 223?187 BCE. 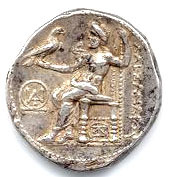 Antiochus IV Epiphanes ruled Palestine between 187 - 164 BCE. 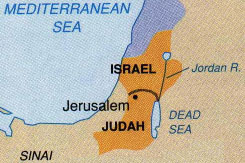 Maccabean revolt, led by Judas Maccabeus happened during rule of Antiochus IV Epiphanes. Hasmonean rule started in 161 BCE. 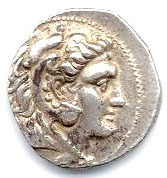 Didrachm (1/2 shekel) from the time of Seleucid rule of Palestine. Obverse : Bust of Melqart.